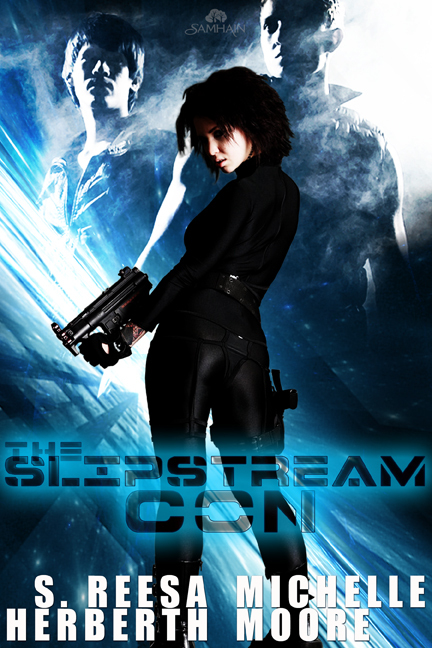 Coming next Tuesday, 04.05.2011 – The Slipstream Con! The time is fast approaching- The Slipstream Con is almost here! Our latest Ylendrian adventure follows the story of two bounty hunters, Tal and Vanya Serafine-Reyes, and the con man and art thief extraordinaire they’ve been chasing across the ‘verse for over three years, Kellen Frey. Would you like to read the first chapter? (Spoiler: You would!) Just click on the excerpt tab on the Samhain site, and behold the space opera goodness. Are you more of a visual learner? Learn how pretty our cover is! We’ll be talking about the book on The Galaxy Express next week, and there are sure to be contests coming up, but if you just can’t wait, we don’t blame you! You can purchase your very own copy of The Slipstream Con at any of the fine establishments listed below, as well as directly from Samhain Publishing. We can’t wait to share this story with you, and we look forward to the book (and Kellen) escaping out into the world.